A new poll shows that where disdain over marijuana in the U.S. once thrived, compassion now resides, and that’s good news for cancer patients. The CNN/ORC International phone survey conducted earlier this month shows the majority of Americans now support the legalization of marijuana. Twenty states and the District of Columbia have approved the legalization of Cannabis sativa since 1996. 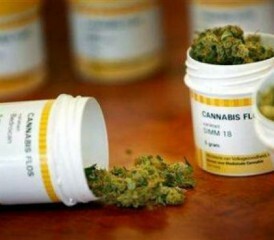 Four more states are expected to legalize the use of medical marijuana this year. People with cancer, seizure disorders, multiple sclerosis, glaucoma, insomnia, Crohn’s disease and other conditions are getting relief from symptoms through medical marijuana that they’ve never experienced before through pharmaceuticals. Major news outlets are reporting on the nation’s changing views of marijuana, and they’re even explaining how patients can find medical marijuana dispensaries in different states. CNN’s chief medical correspondent, neurosurgeon Dr. Sanjay Gupta, spent a year working on a marijuana documentary and publically apologized for his previous denouncement of the plant as medicine. “We have been terribly and systematically misled for nearly 70 years in the United States, and I apologize for my own role in that,” admits Dr. Gupta. Google search queries on medical marijuana have steadily increased as more states approve its use. People are feeling safer about researching the herb, especially after the federal government said it wouldn’t challenge state laws that legalize the plant. Dr. Lester Grinspoon, professor emeritus of psychiatry at Harvard Medical School, says this progress is long overdue. “Like everyone else who has been working over decades to ensure that marijuana, with all that it has to offer, is allowed to take its proper place in our lives, I have been heartened by the rapidly growing pace at which it is gaining understanding as a safe and versatile medicine,” Grinspoon said. But many still question its merits. Why is cannabis such a versatile medicine? How does it seem to offer symptom relief for so many medical conditions? The answer lies in the endocannabinoid system, which is a system of cannabinoid-like chemicals, cell membrane receptors and other molecules made naturally in the human body. As science seeks to understand the endocannabinoid system, researchers are learning more about how marijuana helps so many health conditions, including cancer. First, let’s clarify cannabinoids a little further. They are chemicals that were originally found in cannabis plants, and later identified in humans. The cannabinoids in marijuana are called phytocannabinoids (phyto meaning plant), and the cannabinoids found in humans are called endocannabinoids. Endocannabinoids behave like messengers between cells in our body. They attach to specific receptors on the surface of certain cells and work to fine-tune communication in our brain, central nervous system and immune system. The endocannabinoid system developed early in evolution, roughly 600 million years ago. We didn’t discover it until the late 1980s, approximately 24 years after the discovery of tetrahydrocannabinol (THC), the most known cannabinoid. Scientists were attempting to understand how THC made people high and discovered a previously unknown physiologic system in the process, dubbing it the endocannabinoid system. Research progress was made in the early 1990s with the discovery of the receptors in which THC and other phytocannabinoids bind to, known as CB 1 and CB2. Since then, thousands of studies have investigated the endocannabinoid system and revealed how important it is to the central nervous system and the immune system. Scientists discovered that CB1 receptors are primarily found in brain and connective tissues, the nervous system, glands, gonads and organs. CB2 receptors are mainly found in immune system cells. The distribution of these receptors is why medical marijuana can affect the human body in so many different ways. The fact that CB2 receptors are found in the immune system helps explain why marijuana can improve some medical conditions beyond simply treating symptoms. For example, a study conducted by researchers at Israel’s Meir Medical Center showed that smoking two medical marijuana cigarettes a day for eight weeks caused Crohn’s disease to enter remission in 45 percent of patients, and 90 percent experienced significant disease improvement. Pharmaceutical companies have developed synthetic versions of THC with the hope they would prove equally therapeutic as marijuana. Unfortunately, lab-created THC doesn’t work as well as naturally derived THC, and scientists suspect the combination of other phytocannabinoids in marijuana are what contribute to the plant’s diverse healing potential. THC: It relaxes muscles, reduces inflammation and blood pressure, stops seizures, stimulates appetite and the brain, and acts as an anti-depressant. more physical high than a mental high. It reduces pain and nausea, decreases anxiety, and acts as a sedative, anti-seizure and anti-schizophrenic. CBN: Similar to THC, cannabinol has less psychological effects. It reduces seizures, relieves pain and lowers pressure in the eye (helps with glaucoma). to act as a sedative, pain reliever and anti-inflammatory. properties, CBG acts as a sedative and anti-inflammatory, and lowers pressure in the eye. These phytocannabinoids and others work in concert. Isolating them diminishes their therapeutic effect. Together they medicinally impact the endocannabinoid system to reduce various disease symptoms and improve certain medical conditions. The medical properties of cannabis don’t stop at symptom relief. Studies show that it could become an anticancer treatment, too. According to research, the endocannabinoid system plays roles in the control of cell survival, transformation and death. Some scientists believe that phytocannabinoids might stimulate the endocannabinoid system to treat cancer naturally. Studies on cancer and cannabis have demonstrated that phytocannabinoids cause certain cancer cells to die, may reduce metastasis and extend survival. The first study of THC’s effect on cancer in humans was published in 2006. The study was small and included only nine patients with glioblastoma multiforme, one of the most aggressive forms of brain cancer. A slight extension of survival was observed, which impressed researchers because all other traditional treatments had failed the selected patients. The results prompted the recent start of a cannabis-based brain cancer drug clinical trial in the U.K.
Aside from clinical trials, the Internet is filled with personal accounts from cancer patients claiming their cancer was cured with cannabis oil. The lack of scientific evidence to support their claims makes many medical professionals wary, but intrigued nonetheless. Medical marijuana in America and its use in cancer care, including how it can help people with mesothelioma, will continue to generate news in the coming years.